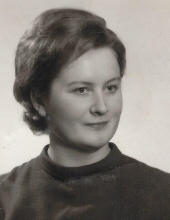 JANINA OLCZAK (nee Bernecka), beloved wife of Wladyslaw Olczak; loving mother of Leslaw (fiancée Amanda Bark), Anna (Marek) Sutor, Wieslaw, Grzegorz, Marcela (Daniel) Lucianek, Roland (Nicole), Sylwia (Keith) Clinton and Wiola (fiancé Steve Smock) Olczak; dearest grandmother of Celine and Daniel Sutor and Julliette Lucianek; fond sister of Wladyslaw (Aniela) Bernecki, Renata (Stanislaw) Trabka and Aleksandra (late Edward) Turek; also survived by many brothers-in-law, sisters-inlaw, nieces and nephews. To send flowers or a remembrance gift to the family of Janina Olczak, please visit our Tribute Store. "Email Address" would like to share the life celebration of Janina Olczak. Click on the "link" to go to share a favorite memory or leave a condolence message for the family.